Let's talk skin. My skin has become miles better than the lumps and bumps activity that festered on my jawline, oh, about 4 years ago, right before we moved to Sydney. I was also once a very pimply foreheaded teen, and I have awful high school ball pics to prove it (I didn't believe in foundation or concealer back then...WOW I know). Since departing a daily air-conditioned office environment though, I have to say my skin has been the best that it's ever been. I can't say that running away from the stresses of a corporate environment was 100% the answer, because I do have to pay tribute to the water beauty products which I have consistently incorporated into my skin regime. In no particular order, here are the watery makeup removers treatments and toners which have worked oh so very well for me in the last 8+ months... and have allowed me to save my pennies , not needing to visit the skin facial clinic! BIODERMA SENSIBIO H20 SOLUTION - An oldie but always a goodie. Every girl, woman, man and their dogs talk about it. I'm probably onto my 50 millionth bottle of this stuff, as I mentioned in my last beauty review, I quite like this stuff. Not only for myself but also for cleansing client skin. I also personally use this (and Yumei below) with a cotton bud to erase wobbly eyeliner lines during winged liner practise at home. YUMEI FLAWLESS FACE EYE CLEANSING WATER - If you can find this in a local Asian beauty store or perhaps your local beauty store if you're in Asia, then you are one lucky ducky! I have to say this was an unexpected star. I picked this up in Hong Kong almost 18 months before I even tried it, and to my surprise, the bottle lasted me over 6 months, and now I'm on the hunt for another. 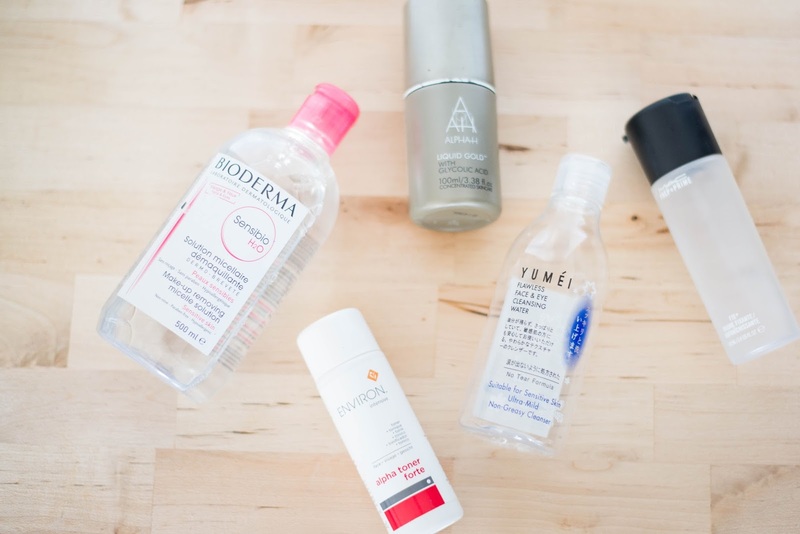 With a nice medium sized bottle (much smaller than a Bioderma, and more transportable), a little goes a long way. Whenever I used this to clean the excess sebum (read face oils) off my skin in the morning, I used no toner or moisturiser afterwards, and my skin felt fresh and cleansed throughout the whole day with no inkling of dryness or feeling like my face will crack. I have been using this on some girls as skin prep before makeup application but never noticed the real benefits until I tried it on a daily basis myself. The label says it has moisturising properties of which I totally agree, there is no fragrance and I've used it on sensitive to combination/acne skins with no negative reactions to report. Of course Bioderma will always be a favourite in my kit (professional and personal), but Yumei to me is like a mini level above Bioderma and has become my new secret weapon, doing triple duties in cleansing, toning and light moisturising, all from the one bottle. If you can't find this in shops anywhere, click on this link to find it here. ALPHA H LIQUID GOLD - The skin facial lady, to whom I owe the majority of my skin clarity to, always promoted the use of a glycolic treatment after every facial extraction. Now this used to scare me to no end, but after a few applications, I was convinced that glycolic acid did help treat my severely dehydrated skin, and helped my skin absorb more of the nutrient value of any moisturiser that was applied over top. I have noticed my skin becoming thinner over the years (woe is me and the ageing process right? ), and scrubbing my face with gritty exfoliants just doesn't always cut the mustard... nor does it help with my skin sensitivities. With my long stint off regular paid work, I had to dial down the frequency in which I pay my facial lady a visit. Instead, I researched to death what I could do to help decongest my skin at home, and Alpha H Liquid Gold came up trumps across a lot of the beauty bloggers that I follow. Marketed as a skin resurfacing and firming lotion, it is a liquid of a toner consistency, containing glycolic acid, targeted at those with mature, sun-damaged or acne scarred skin. When I found out that it was an Australian brand and Australian made, i.e. easily accessible, and fairly priced, that was enough to send a 100ml bottle into my shopping cart. I use this every 2nd or 3rd night by applying it like a normal toner solution, on a cotton pad and swiped across my whole face and neck, and then leave it on without a followup moisturiser for a more intensive treatment. I can immediately feel the glycolic acid nibbling away at any impurities and dead skin that may be sitting on the surface of my skin. The next morning, I am always GUARANTEED to have silky feeling baby bottom skin. I can't describe it. It has got to be the most happiest I've felt with my skin in the longest time. AND, it's been 8 months since I've seen my facial lady. I haven't had signs of facial eczema nor an acne infiltration operation for quite some time (knock on wood!). Over time, the use of this and the Yumei cleansing water has definitely given my skin a bit of bounce. I've just run out of my first bottle after a few months and I'm going to take advantage of the 25% off discount on Skincare Store and repeat purchase this, pronto! ENVIRON ALPHA TONER FORTE - some beauty gurus have noted that Alpha H Liquid Gold can do double duty as a bit of a pimple killer, but whenever there is a heavy duty zit requiring a major zap, I always whip out my Environ Alpha Toner, and dab on a bit of the toner with my fingers on the targeted mole hill that has erupted on my face. Mild stinging does ensue, but it quickly dissipates and I seem to like the sensation, as if it sends signals that it is really killing something. Just be careful not to put too much on the surrounding skin, as this could unintentionally dehydrate the healthy surrounding skin a bit. MAC PREP & PRIME FIX + - My go to for everything. Foiling eyeshadow powder, spritzing on pre, mid and post makeup application to set or revive makeup, spritzing while feeling parched, spritzing while you're in hot weather, just spritz spritz spritz everywhere. I don't know what exactly is in this stuff aside from water, anti-oxidants and good-for-you-minerals (of the non-pore clogging kind) , but it is a spray I generally trust this stuff will help me when my skin looks and feels parched, when my makeup looks too matte or dry, and when my friends look like they need a perk me up. Rest assured a spritz of this stuff on your face or your friend's faces, will make you feel pretty refreshed. I've been known to whip a mini bottle of this out at parties or at weddings. True story. GOOD OL' ICE COLD H20 - Of course nothing works better than nature's own juice. I don't literally count the typical 8 glasses a day that most are prescribed to drink, but I have made the effort to always drink a glass as soon as I wake up and keep a pretty looking 500ml glass on my desk during the day, to motivate me to drink more. And on days when I'm not feeling like the flat stuff, I love a good litre of soda or bubbly mineral water. Yes, I can drink that stuff by the litre. 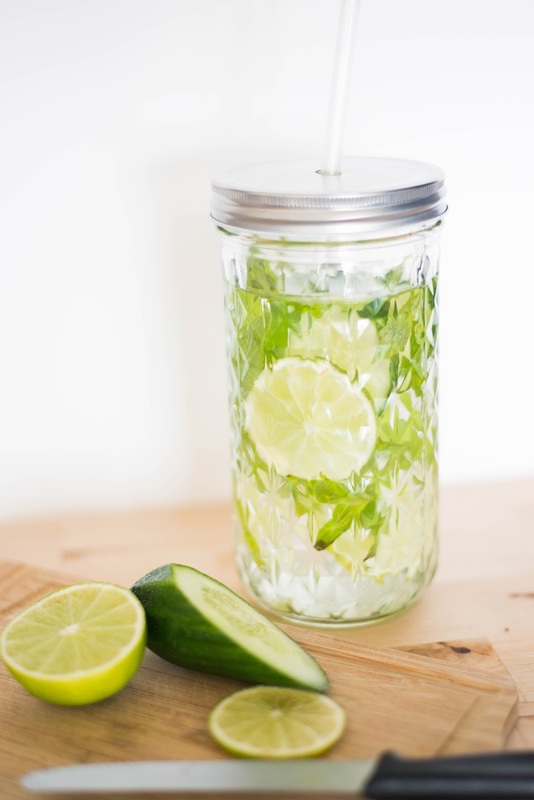 If you're not good at drinking water, perhaps try flavouring it with a couple slices of fresh cucumber and lime? Or even slices of sweet strawberry? If you can't afford any of the skin care items I spoke of above, then good ol' iced H20 is always a must. Next up, I have my eyes set on trying out something from the SK II range. I've been wanting to add this to my beauty repertoire for quite some time, so stay tuned to see if I yield any success!